Posted on August 29, 2013 Posted in Elementary, High School, Middle School, My Products, Teachers Pay Teachers	. I just spent a couple of days updating the designs for my printable Facebook Profile and Pinterest Board. They now reflect the most current versions of the social networks that your students are enjoying right now! I use these printable templates in my class by having my students fill them in with information about book characters and/or authors. They get the kids to think critically and dynamically about the things that are important to the character or author. 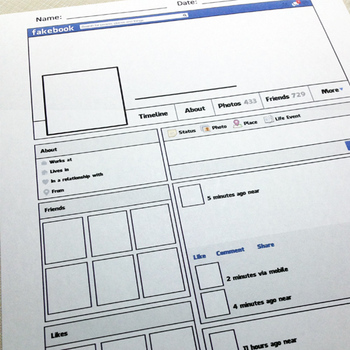 I’ve found that students relate to the material a lot better after completing these social media templates. But, these printable templates are not just for ELA! I have colleagues that use them for studying scientists, historical figures, artists, composers and more! The possibilities are truly endless! Also, don’t forget to check out my Printable Twitter Feed. While not newly updated, it’s still current and finishes out the trifecta of social media printables.